WhatsApp, the world's most popular mobile messenger service with over 900 million active users a month, has decided to drop its annual subscription service. "For many years, we've asked some people to pay a fee for using WhatsApp after their first year. As we've grown, we've found that this approach hasn't worked well. Many WhatsApp users don't have a debit or credit card number and they worried they'd lose access to their friends and family after their first year. So over the next several weeks, we'll remove fees from the different versions of our app and WhatsApp will no longer charge you for our service," WhatsApp Inc said in its blog post. 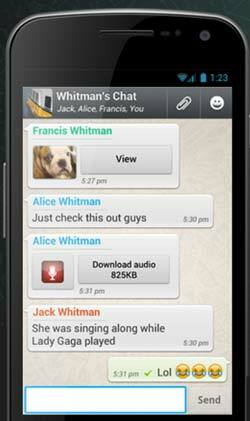 Until now, WhatsApp has been free for the first year and charged most users $0.99 per year. It will stop charging subscription fees immediately. However, as far as a new business model is concerned, WhatsApp said it is not going to introduce third-party advertisements. Advertising is a revenue channel for a majority of apps available on Android Play Store or Apple's App Store. WhatsApp, which was acquired by Facebook in 2014, said it will explore ways businesses and organisations communicate with individuals, but the aim is to give an experience without third-party ads and spam. "Starting this year, we will test tools that allow you to use WhatsApp to communicate with businesses and organisations that you want to hear from," it said in the blog post. Such communications could be with a user's bank about a transaction or with an airline about delayed flights. "The kind of messages and alerts that we normally get on our phones might soon start appearing on WhatsApp, and more and more businesses might create their account on WhatsApp," it said. However, it is yet to come up with a strategy on how to earn revenue from businesses that use WhatsApp to connect with their customers. While the US-based firm, that followed a strict no-ads policy for many years, was charging $0.99 annually from users on the iOS platform, it did not enforce this strictly for users on others platforms such as Android, especially from users in India and possibly some other countries. In India, WhatsApp has remained free due to several ecosystem issues such as low penetration of credit cards. WhatsApp is the most used instant messaging app, and according to a TNS report, 56 per cent of the country's internet population use the messenger service, followed by 51 per cent using Facebook. Many small businesses in the country rely on WhatsApp to connect with their customers.